Ukraine Leader Says Trust Building With U.S.
SEOUL, South Korea -- Ukrainian President Viktor Yanukovych said trust was growing between himself and U.S. President Barack Obama after they met at a multinational summit where Mr. Yanukovych worked to build his credibility with the West. 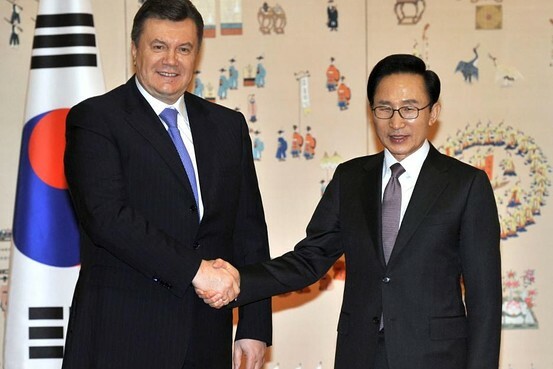 South Korean President Lee Myung-bak, right, meets with Ukraine's counterpart Viktor Yanukovych in Seoul on Wednesday. "We have reached an eye-to-eye position," Mr. Yanukovych said in an interview. " All issues that are on our agenda, they will be completed." Mr. Obama met with Mr. Yanukovych for about 20 minutes on Tuesday during a break in the Nuclear Security Summit, where Ukraine's removal of dangerous fissile materials was one of the most significant achievements reported by the approximately 50 participating nations. According to a White House statement, Mr. Obama praised Ukraine for "courageous leadership on nuclear security." But he also told Mr. Yanukovych that the U.S. is hoping to see fair and free elections in Ukraine later this year and is concerned about the prosecution of political opposition figures. Mr. Yanukovych's opponent in the 2010 election, Yulia Tymoshenko, was convicted of corruption and jailed last year, sparking criticism that her prosecution was politically motivated. While he has hinted that Ms. Tymoshenko could be released through changes to the criminal code, investigators have opened new criminal probes against her. Her incarceration has damaged Mr. Yanukovych's reputation in Europe and the U.S., and undermined his economic agenda, including efforts to join the European Union and create a regional free trade area. Ukraine's recovery from the 2008 global economic downturn has been stunted by crippling energy prices and two years of unsuccessful negotiations with Russia to reduce the price it pays for natural gas. Last week, a deputy economy minister suggested to reporters in Kiev that Ukraine may attempt to restructure its debt with the International Monetary Fund. But in the interview Wednesday, Mr. Yanukovych appeared to rule that out for now. "That renegotiation is not on the agenda today," he said. "Ukraine is very responsible for its external obligations and pays and services all its loans in time." The IMF last year halted a $15 billion lending program to Ukraine after the government refused to raise household gas prices to help the state gas company balance its books. Mr. Yanukovych said Ukraine has observed all other IMF requirements but can't raise gas tariffs because Ukrainians already pay some of the highest gas prices in the world. Mr. Yanukovych's high-profile role at this week's Nuclear Security Summit in Seoul was in large part a consequence of Ukraine being the site of the explosion of the Chernobyl power plant in 1986, the world's worst nuclear-power accident. He said the country shares with Japan the experience of "overcoming nuclear tragedies." Over the past two years, Ukraine returned to Russia 200 kilograms of highly enriched uranium, — a fuel for nuclear plants and a key ingredient in atomic bombs — that had been consigned decades ago when Ukraine was part of the Soviet Union. The train carrying the last 19 kilograms (42 pounds) of HEU departed Kiev on Saturday night. In the interview, Mr. Yanukovych said: "Now I can say the security situation in Ukraine has improved. There is no threat of a terror attack for Ukraine and the region because all nuclear materials have been taken away." Next month, construction is scheduled to begin on a new $1 billion shelter over the Chernobyl plant. The new shelter will slide over the concrete "sarcophagus" that was hastily built around the reactor not long after the explosion and meltdown to halt the release of radiation.